Non-enveloped capsid with a T=7d icosahedral symmetry, about 50 nm in diameter. Circular dsDNA about 5 kb in size, associated with cellular histones in a chromatin-like complex. Encodes for 5-9 proteins. On rare non-specific recombination, the viral genome can be integrated in host chromosome. This inactivates the integrated virus but can give the host cell a replicative advantage sometimes leading to malignant tumours. Transcription is nuclear, in two phases; early (replication), late (virion assembly/exit). 5-9 proteins are expressed from the two pre-MRNA by alternative splicing. All genes are transcribed by host RNA pol II. Attachement of the viral proteins to host receptors triggers lipid-mediated endocytosis of the virus into the host cell. Import of genomic DNA into host nucleus. Replication of the DNA genome in the nucleus. Transcription of late genes encoding for structural proteins (VP1, VP2 and VP3). 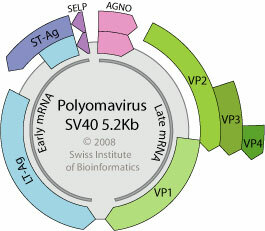 Assembly of new virions in nuclear viral factories. Virions are released by lysis of the cell. CELL TROPISM JCPyV: respiratory system, kidneys, or brain. BKPyV: respiratory system, latency in kidneys. ASSOCIATED DISEASES JCPyV: progressive multifocal leukoencephalopathy. TRANSMISSION BFPyV: contaminated feces and aerosolized dust. Egg transmission. The large T antigen binds to host key cell cycle regulators retinoblastoma protein RB1/pRb and TP53 and induces the disassembly of host E2F1 transcription factors from RB1, thus promoting transcriptional activation of E2F1-regulated S-phase genes.